1.a.m. insane confession I'll be telling you. 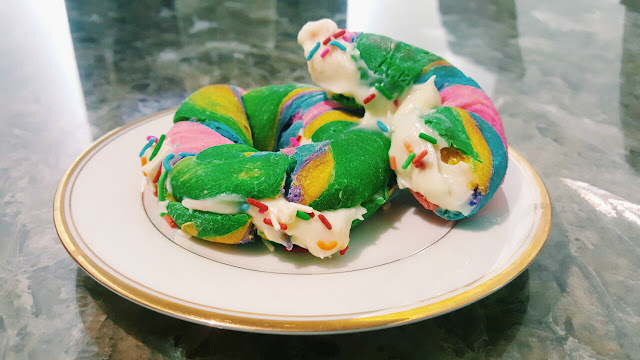 I've been craving for rainbow bagels these past few months since I saw this one video from facebook. In Brooklyn, NY, there's this one bakery called Bagel Shop, had came out with this idea of producing rainbow bagel to make things more interesting. Then, I have been noticed that there's one cafe in Kuala Lumpur, is selling this terrific bagel. But, I'll post the review about it next time. The thing is, I decided to do something insanely stupid as my brother was suggesting the idea of " Why not we do this at home?" Yes, I agreed to that which gave me 70% of regrets. As we've been making this bagel, well I said it took tons of patience because it's super hard. I spent almost 5 hours doing this I swear but there are some we decided to store it as we'll continue doing it tomorrow. It is worth the time [ I guess ]. Super delicious for a first-timer.
" The way I see it, if you want the rainbow, you gotta put up with the rain. " Some will said " OMG, A2 is around the conner and she still have time to do all this thing."